Vascular lesions are normal veins that have dilated under the influence of increased venous pressure. As we age, valves in our leg veins become less efficient, so less blood is pumped back from the legs. This means blood vessels in our legs become larger, darker and more visible. In severe cases, varicose veins may form, and may require surgical treatment (vein stripping). Other vessels can be treated by injection (sclerotherapy). Smaller vessels (leg talangiectasias) are often treated by our Ellipse Nd YAG laser. This depends on the size of your leg vessels, and also on your medical history. Your skin specialist can advise if your vessels are too large for treatment or if you have one of the few pre-existing medical conditions that may make you unsuitable for this type of treatment. This will vary depending on the area being treated, however treatment times could take anything from 15 mins to 45 mins. Ellipse leg vein treatment uses the latest in cooling techniques - SoftCool, to minimise discomfort and protect the surrounding skin. Most people find that treatment of smaller vessels is practically pain free. Even treatment of larger vessels is only mildly uncomfortable. The results are worth it, Ellipse treatment hurts less than those from most other Nd:YAG systems. Smaller vessels can disappear immediately after treatment, larger ones fade away more gradually over the next few weeks. Normally patients experience a little redness and/or swelling (lasting up to 2 days) in the treated area. Rarely, blood may collect in the treated vessel. In this case your skin specialist will most likely request that you call back two days after your treatment. This depends on the number of vessels to be treated. A single treatment is typical for most individual vessels, though some larger ones may need a second treatment. Your skin specialist will be able to make a more accurate assessment following examination. Clinical trials documenting Ellipse’s safety and effectiveness are carried out by leading doctors prior to the release of the product. The results of these tests are then published in respected, refereed medical journals. You are welcome to view these scientific papers on the Ellipse website at www.ellipse.org. Ellipse offers a clinically proven effective treatment to remove leg veins, either on its own or as a follow up treatment to sclerotherapy. 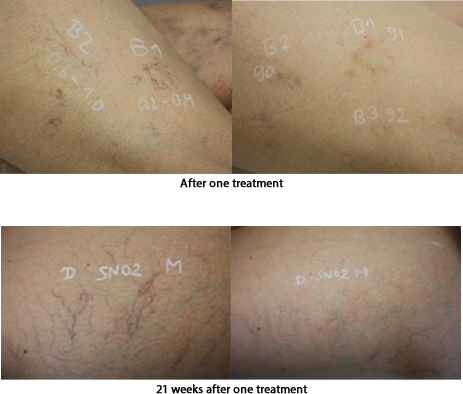 Whereas classical IPL works for certain smaller leg veins, it is generally accepted that Nd:YAG technology is much more effective than IPL for the majority of leg veins. Research has shown that an Ellipse Nd:YAG treatment is suitable for resistant telangiectasias (those that reappear after IPL treatment).